Who are all the women being photographed naked in the swamp? What made Coleman draw on his face with magic markers? Where is the cruise-to-nowhere taking its drunk prisoners? When was the last time a Civil War reenactment involved a sports car? But Serge also has some personal business to tidy up. His grandfather’s old Miami Beach gang suddenly had their life savings wiped out, and there’s a good bet it was no accident. Too much action for Serge to juggle? Not when it all dovetails nicely into his Secret Master Plan. And especially if it involves Serge’s favorite new obsession: tracking Al Capone’s little-known escapades in the Everglades. 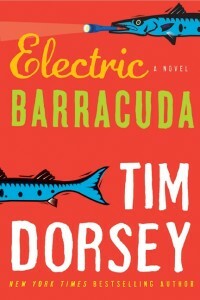 So gas up the car, say good-bye to the relatives, and join Serge on the lam as he drives straight for the deepest bowels of Florida to unravel the final mysteries of Electric Barracuda. Tim Dorsey was born in Indiana, moved to Florida at the age of 1, and grew up in a small town about an hour north of Miami called Riviera Beach. He graduated from Auburn University in 1983 with a B.S. in Transportation. While at Auburn, he was editor of the student newspaper The Plainsman. From 1983 to 1987, he was a police and courts reporter for The Alabama Journal, the now-defunct evening newspaper in Montgomery. 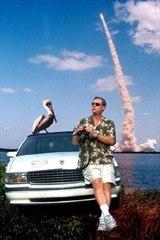 He joined The Tampa Tribune in 1987 as a general assignment reporter. He also worked as a political reporter in the Tribune’s Tallahassee bureau and a copy desk editor. From 1994 to 1999, he was the Tribune’s night metro editor. He left the paper in August 1999 to write full-time. Tim has since published twelve novels in several languages: Florida Roadkill, Hammerhead Ranch Motel, Orange Crush, Triggerfish Twist, The Stingray Shuffle, Cadillac Beach, Torpedo Juice, The Big Bamboo, Hurricane Punch, Atomic Lobster, Nuclear Jellyfish, and Gator A-Go-Go.